It's a well-known fact that at Whitechapel station the Overground goes under the Underground. How we laughed the first time we were told. How weakly we now smile. If you've been down to Whitechapel recently, you'll know that the Overground looks a lot more underground than it did before. Previously it ran through the station in a cutting, open to the sky, but enabling works for Crossrail have put paid to that, and as 2017 has progressed the sky has disappeared. 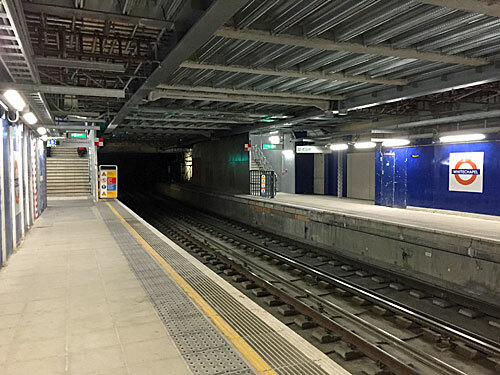 A brand new concourse has been built directly above the Overground track and platforms, which from December 2018 will provide customer access across the heart of the station. To the south will be the main entrance on Whitechapel Road, while to the north will be the escalators leading down to the Crossrail platforms. You can get a slight glimpse of almost what's happening up top if you use the new footbridge, very recently opened to link the northern ends of the two Overground platforms. But Whitechapel's not the only place where the Overground goes under the Underground. This amusing contradiction isn't just restricted to stations, there are sections of track where it happens too. So this evening I'm wondering if we can make a definitive list of all the places where the Overground passes underneath the Underground. There are at least twenty locations on the tube map where the two networks intersect, so I reckon we might be able to find around half a dozen. n.b. A delightful design quirk of the tube map is that if a tube line is drawn underneath another tube line, then it also passes underneath that tube line in real life. But that's not the case for the Overground, which is always drawn underneath all the other lines, so this particular feature won't help you in today's quest.